Are you needing a quick and simple treat to take to a Halloween party this weekend? 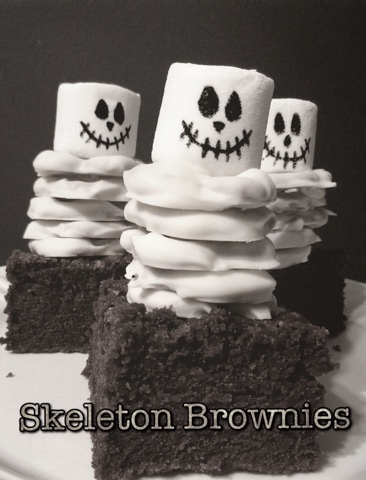 I made these cute skeleton brownies the other day for a bake sale and they all sold very fast. I recieved a ton of compliments and people thought it took me hours to do, when in fact it took me no time at all. White bakers chocolate- I bought two bars of the Almond White Chocolate. Use your judgement on how much you need to buy. (If you want to save time and not dip the pretzels in the chocolate you can buy bags of the Flipz White Chocolate Pretzels. But be warn there is not that many in a bag. If doing this you will not need the bag of pretzels and just a very small bag of Bakers White Chocolate.). To start, bake the brownies per the directions on the box. While they are baking start dipping your pretzels in your melted chocolate. I dipped one half then layed the pretzel down to dry on wax paper. Once the chocolate was harden I dipped the other side and layed it down to harden again. You want the pretzel to be covered all over with chocolate. While you are waiting for the chocolate to harden and the brownies to finish use your edible marker and make faces on the marshmallows. Once everything is ready melt some chocolate in a bowl, because you will use the melted chocolate as glue. Cut your bownies in squares. Once cut, take 5 to 7 pretzels and stack them together. Place some melted chocolate on the bottom of each pretzel to make them stay together. Place the stack on the brownie. Make sure to place some melted chocolate on the bottom to get the stack to stick to the brownie. Next dab some melted chocolate on the bottom of the marshmallow and place it on top of the pretzels. 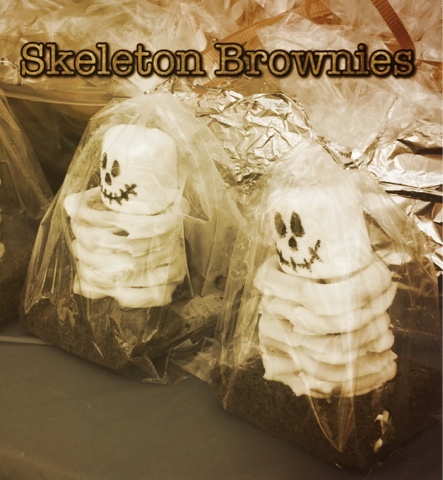 Finally place the brownie skeleton in a treat bag and tie it up. You can even add a cute sign. Happy Halloween!! Hope everyone likes your treats.